Few things bother me more than throwing out food. What could be more wasteful than letting perfectly good nutrition rot in the refrigerator when people are starving? Then there’s the money you spent on the food in the first place, gone without benefit. So we try to be really good about eating up our leftovers. We even bought a food-saver with last year’s Christmas money, to better extend the freezer life of our excess. In order to make leftovers more exciting I try to rework them, making hashes and salads instead of simply reheating last night’s dinner. All of these tricks are pretty good, and while we still have to throw out the occasional moldy tomato, we waste very little. I like to use thighs for my fresh meat, because they’re cheap and more flavorful, since they’re dark meat. Throw them in the pot with a bay leaf, carrots, onions, and celery, cover the whole mess with water, and you’re good to go. After the stock is done, it continues to help you recycle! The most obvious use for stock is soup, which in our house is the favored way of dispatching with vegetables that are still good but on the verge. It’s much easier to eat carrots, green beans, corn, onions, peas, and broccoli all in one meal when it’s in the soup pot. In our last creation we even tossed in a little left-over pancetta, which added a pleasant saltiness to the finished soup. 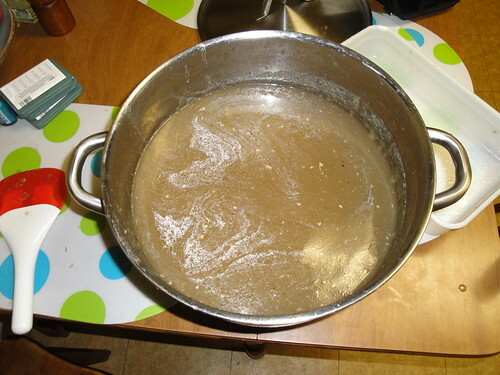 Stock is also the key ingredient in risotto, another canvas for “whatever we’ve got left in the fridge.” Even if I’m not in the mood for the full risotto treatment, throwing stock instead of water into the rice cooker adds a bit of depth to our meal. Making stock at home is a bit time-consuming, but well worth the minimal effort. We’ve never wasted a drop! This entry was posted in Food and tagged Food. Bookmark the permalink. I like to roast a chicken for dinner (and leftovers! ), toss the carcass and whatever else into the slow-cooker before bed, and wake up to a pot of gold! Nothing has to be cut up pretty, or even peeled–including the onions–so the energy required is about zero until straining it in the morning. I save the rinds of hard cheeses (example- provolone) to throw in soups too. I have done that but often forget – it’s a great tip, Elise! Mmmm yes! I love making stock. Have you ever made shellfish stock? I keep meaning to save shrimp shells and heads for this. I have not yet made shellfish stock – but I’d like to!